In the posts in this category you will find Python scripts. Python is said to be one of the easiest programming language to learn. Learning one language will also make it easier to learn another, much more advanced, one. As a Bachelor student in the cognitive science programme I got to take Python courses. However, it was not before I started my Ph.D years that I realized how much use I had because I knew some programming. For a psychology researcher Python might be ideal since it is relatively easy to learn and there is a huge Python community to get help from. How to build experiments using free and open-source tools such as PsychoPy, OpenSesame, Expyriment, and PyEPL is, for instance, something you could find in this category. 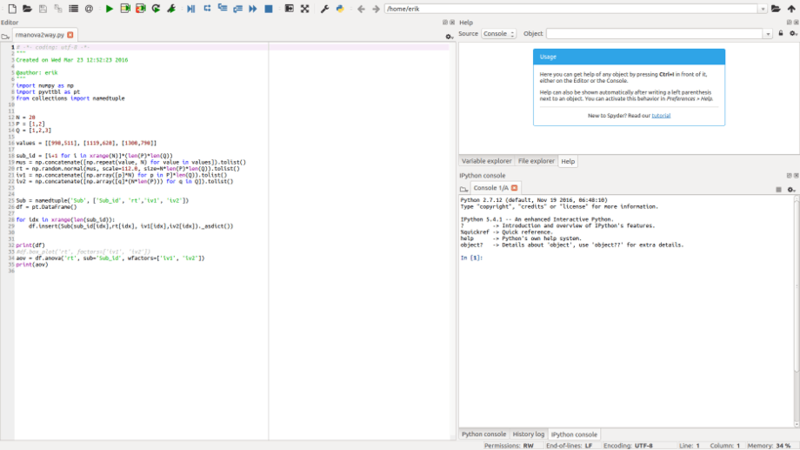 In this post, PyCharm vs Spyder will be compared. If you have followed my blog you may have noticed that a lot of focus have been put on how to learn programming (particularly in Python). I have also written about Integrated Development Environments (IDEs). I think that an IDE may, in fact, be very useful when learning how to code. Of course, when it comes to Python IDEs it may be hard to choose the best one (e.g., PyCharm vs Spyder?). Spyder is one of my long-time favorite IDEs, and I am mainly using Spyder when I have to write code in Windows environments. However, in one of my blog posts PyCharm was suggested in one comment (see the comments on this post: Why Spyder is the Best Python IDE for Science) that I should test PyCharm. 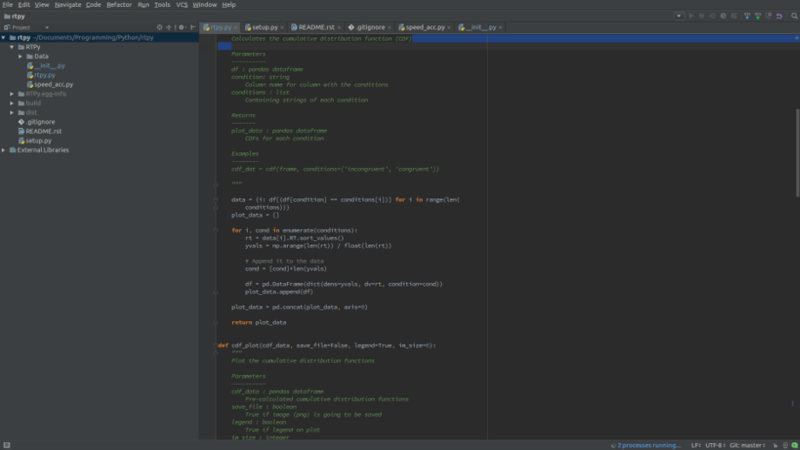 After testing out PyCharm I started to like this IDE. In this post you will find my views on the two IDEs. E.g., I intend to answer the question; which is the best Python IDE; PyCharm or Spyder? In this short post we are going to revisit the topic on how to carry out summary/descriptive statistics in Python. In the previous post, I used Pandas (but also SciPy and Numpy, see Descriptive Statistics Using Python) but now we are only going to use Numpy. The descriptive statistics we are going to calculate are the central tendency (in this case only the mean), standard deviation, percentiles (25 and 75), min, and max. One of the great things with programming is that you can automate things that is boring. As a student I often get schedules in the form of Word documents. I prefer to have all my activities in a calendar and used to manually put every time in a course into my calendar. Today I got a new schedule and thought: I could probably do this using Python. After some searching around on the Internet I found the Python packages python-docx and iCalendar. In this post I will show you how to use these to packages to create an iCalender file that can be loaded in to a lot of available calendars. Inspired by my post for the JEPS Bulletin (Python programming in Psychology), where I try to show how Python can be used from collecting to analyzing and visualizing data, I have started to learn more data exploring techniques for Psychology experiments (e.g., response time and accuracy). Here are some methods, using Python, for visualization of distributed data that I have learned; kernel density estimation, cumulative distribution functions, delta plots, and conditional accuracy functions. These graphing methods let you explore your data in a way just looking at averages will not (e.g., Balota & Yap, 2011). Python is gaining popularity in many fields of science. This means that there also are many applications and libraries specifically for use in Psychological research. For instance, there are Python packages for collecting data, doing basic statistics and analysing brain imaging data. In this post, I have collected some useful Python packages for researchers within the field of Psychology and Neuroscience. I have used and tested some of them but others I have yet to try. PsychoPy, as I have previously written about (e.g., Free and Useful Software and PsychoPy tutorial) is really a great Python tool for creating Psychology experiments. You can write Python code by either using “code view” or import the package in your favourite IDE. Furthermore, you can use the builder mode and just drag and drop different items and PsychoPy will create a Python Script for you. If need inline scripts (in Python, of course) can be inserted. That is, you can combine drag-and-drop building with some coding. In this post I have collected some tutorial videos that can be useful for someone unfamiliar with PsychoPy. Previously I have shown how to analyze data collected using within-subjects designs using rpy2 (i.e., R from within Python) and Pyvttbl. In this post I will extend it into a factorial ANOVA using Python (i.e., Pyvttbl). In fact, we are going to carry out a Two-way ANOVA but the same method will enable you to analyze any factorial design. I start with importing the Python libraries that are going to be use. In an earlier post I showed four different techniques that enables one-way analysis of variance (ANOVA) using Python. In this post we are going to learn how to do two-way ANOVA for independent measures using Python. An important advantage of the two-way ANOVA is that it is more efficient compared to the one-way. There are two assignable sources of variation – supp and dose in our example – and this helps to reduce error variation thereby making this design more efficient. Two-way ANOVA (factorial) can be used to, for instance, compare the means of populations that are different in two ways. It can also be used to analyse the mean responses in an experiment with two factors. Unlike One-Way ANOVA, it enables us to test the effect of two factors at the same time. One can also test for independence of the factors provided there are more than one observation in each cell. The only restriction is that the number of observations in each cell has to be equal (there is no such restriction in case of one-way ANOVA). The current post will focus on how to carry out between-subjects ANOVA using Python. As mentioned in an earlier post (Repeated measures ANOVA with Python) ANOVAs are commonly used in Psychology. We start with some brief introduction on theory of ANOVA. If you are more interested in the four methods to carry out one-way ANOVA with Python click here. ANOVA is a means of comparing the ratio of systematic variance to unsystematic variance in an experimental study. Variance in the ANOVA is partitioned in to total variance, variance due to groups, and variance due to individual differences. Partioning of Variance in the ANOVA. SS stands for Sum of Squares.